Precision Surface Grinding, Thread Mills, Rebuilding Services & More! Gates Machine Tool Repair provides precision surface grinding, rebuilding and retrofitting, hydraulic and electrical system service and much more. Why buy new when Gates will restore your equipment to meet or exceed its original specifications! Extend the life of your company’s biggest investments – call Gates Machine Tool Repair today at 281-489-8356. Gates’ complete machine shop services help to preserve and expand your machines capabilities. We have the experience and the knowledge to extend the life of virtually every make and model of machine. We’ll repair components, manufacture replacement parts or alter existing components … whatever it takes to restore your equipment to original specifications. We have the capacity for grinding all ways and slides, covering a broad range of configurations. With planer and grinder capacities among the largest in the world, Gates is able to work with numerous types of ways, columns and other components … in all sizes, shapes and configurations. All jobs are guaranteed to meet or exceed the required specs. We perform extensive final testing on every piece of equipment – no detail is too small. Gates ensures proper alignment of all surfaces and all required bearing surfaces are hand-spotted to ensure proper oil retention. Thread Mills are available for hobbing replacement lead screws, long spline shafts, and continuous keyways – all within a single operation. Gates employs experienced technicians offering complete electrical repair, upgrades and rewiring on new or existing switchgears. Gates repairs, refurbishes and provides upgrades to hydraulic systems. We bring modern technology and parts availability to your older machine tools. Our customers may utilize our Gates’ comprehensive field services. Our highly-skilled technicians will work at your facility as required to repair, dismantle or remove necessary components for service at our shop if needed. Regardless of a job’s complexity, we have what it takes to meet our customers’ needs – today AND tomorrow! Call Gates Machine Tool Repair now at 281-489-8356. 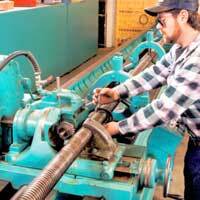 Gates Machine Tool Repair has been based in Manvel, Texas for more than 20 years. From our very first year in business until today, we’ve devoted ourselves to providing the best service and highest quality workmanship available. Our satisfied customers come from a variety of industries and businesses – machine shops, paper mills, aviation, machine tool companies, corporate maintenance departments and more. And, we take exceptional pride in the fact that our clients always return … we rebuild machines AND we build solid relationships with every customer … it’s the Gates way of doing business. With our modern 50,000-plus square foot facility, a staff of highly-skilled craftsmen and our painstaking attention to detail, we’re confident that you’ll find us to be the best choice for rebuilding and repair of your machine tool investments. © 2002 Gates Machine Tool Repair, Inc.